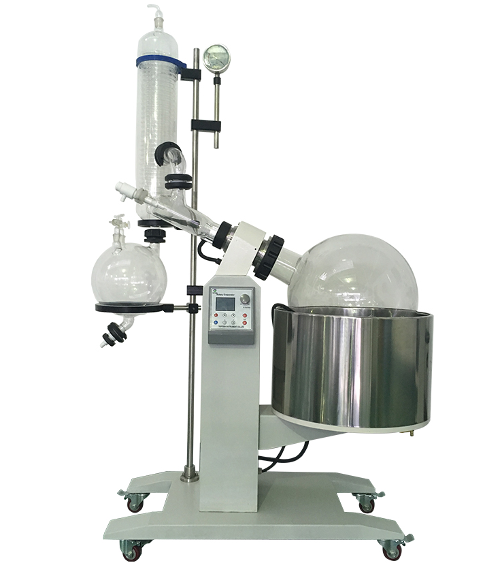 Rotary Evaporators, or Rotovaps, are devices that are used in chemistry and biochemistry labs for the efficient and gentle removal of solvents from a sample by the process of evaporation. Rotary Evaporators are designed to be solid, durable and economical, and are available in multiple different capacities to meet the varied needs and throughput requirements of different labs. LabTech supply a range of efficient, durable and economical Rotary Evaporators, from small to large capacities, to meet your specific needs. LabTech EV400 Series Benchtop Rotary Evaporators are designed to improve the user experience when operating sample separation technology. The flagship feature is an intelligent color display touchscreen that allows users extensive and intuitive control of the rotation and temperature on the unit. Users can program the operation process and fully observe progress on the screen, to accurately monitor their experiments. 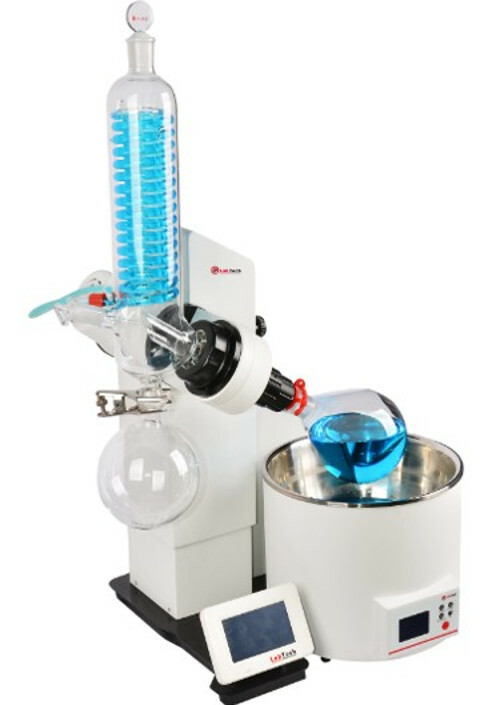 Apart from the advanced touchscreen functionality, the EV400 Series Benchtop Rotary Evaporators also have a variety of other functions that allow scientists to perform advanced sample separation experiments. LabTech employed a heavy-duty brushless motor on the EV400 Series that allows the units to rotate at up to 300RPM with an automated up/down rather than manual lifting. Automation is also included in the stand-alone heating bath. The bath can be used for either oil or water heating and for continued user convenience, it comes equipped with a timer and an automatic shutdown if the bath ever gets dried. Since the heating bath is separate, it also means that maintenance and operation is much easier. EV400 Series Benchtop Rotary Evaporators are compatible with the LabTech Vacuum Controller to extend the functionality and the efficiency. With the vacuum controller and a cooling system, the Rotary Evaporator allows for sample adding through an online valve. The EV400TOUCH has the compatibility to attach and use the LabTech Vacuum Controller, but the EV400VAC is designed with the Vacuum Controller already built-in. The LabTech EV311 Rotary Evaporators series features two different models that provide you with durability, control, reproducibility, and safe use at an affordable price. The EV311H is the more economical model with more basic features and functionality. The defining feature of the EV311 Series is an LCD Digital Display, which unlike other Rotary Evaporators, allows users to finely control the temperature and rotation speed. The dipping angle is adjustable, for variability in use. Furthermore, the EV311 series come with a condenser, all flasks, and a stand-alone heating bath. They are compatible with water or oil baths and because the heating bath is separate, maintenance and operation are easier. The heating bath even shuts off when dry to avoid problems occurring. Micro Lifting Switch for Manual Elevation – Allows for One-Handed Operation. 150 mm Maximum Lift Stroke. Separate Heating Bath Makes Maintenance and Operation Easier. Bath Automatically Shuts Down in Case of a Dry or Empty Bath. LabTech EV400 Series Benchtop Rotary Evaporators are built with solid materials, designed for durability, and are low cost despite their high function. The EV400 Series allows users advanced control of temperature and rotation speed via digital display and intelligent touch-screen interface. Each unit includes a condenser, all flasks, and a stand-alone heating bath. 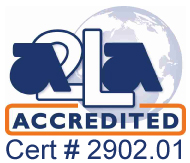 The LabTech LV20 Large Scale 20L Rotary Evaporator is designed to meet the needs of users performing large evaporation projects. The device is equipped with an explosion-proof motor, a stainless-steel heating bath (ambient to 99 ?) and includes a 10L receiving flask and a vertical condenser. LabTech EV311 Series Rotary Evaporators are designed to be solid, durable, and economic; they are the answer to complex, expensive sample isolation. LabTech’s EV311 Series features digital displays so users can easily monitor rotation speed and accurately control temperature. 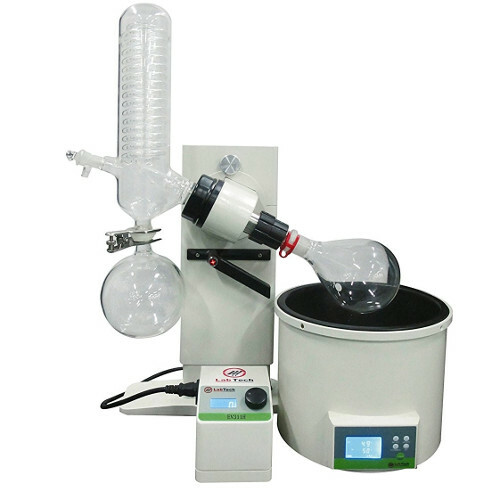 Each Rotary Evaporator includes a condenser, all flasks, and a stand-alone heating bath.